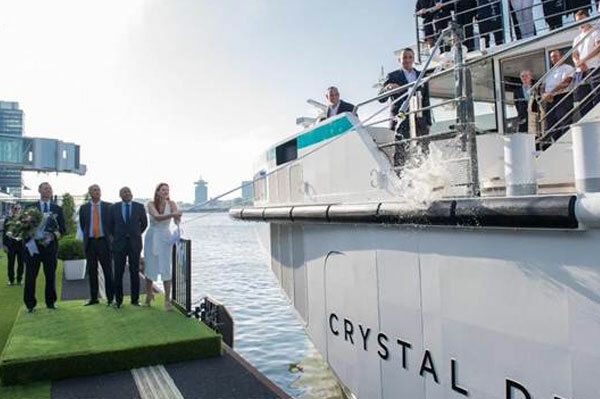 Crystal River Cruises has officially welcomed its newest ship to its fleet as Crystal Debussy was christened in Amsterdam. The ceremony took place during the ship’s three-day stay in Amsterdam on its 10-day “Splendors of the Rhine” voyage, allowing guests aboard the sailing to participate in the traditional festivities, while Crystal crew members looked on from the decks of the ship. Godmother Rachel York serenaded guests with her rendition of “Defying Gravity,” a nod to her esteemed career on the stages of the world, including those aboard Crystal’s ships as part of the Crystal on Broadway program. Sailing itineraries between Amsterdam and Basel, the 106-guest Crystal Debussy embarked on its maiden voyage along the Rhine River on April 9. Guests visit ports in the Netherlands and Belgium on the seven-day itinerary, with 10-day voyages also calling in Germany. Throughout 2018 and 2019, the ship sails routes of seven and 10 days between Amsterdam and Basel along the Rhine and Moselle rivers, visiting Switzerland, Germany, Netherlands and Belgium. Pictured, Captain Ferenc, Crystal Cruises President Tom Wolber, Walter Littlejohn, vice-president and managing director, Crystal River Cruises) and York (godmother).